Castlevania: Dracula X is an interesting entry in the Castlevania canon. This Super Nintendo installment was originally to be the western release of Castlevania: Rondo of Blood, which was released exclusively in Japan on the PC Engine. 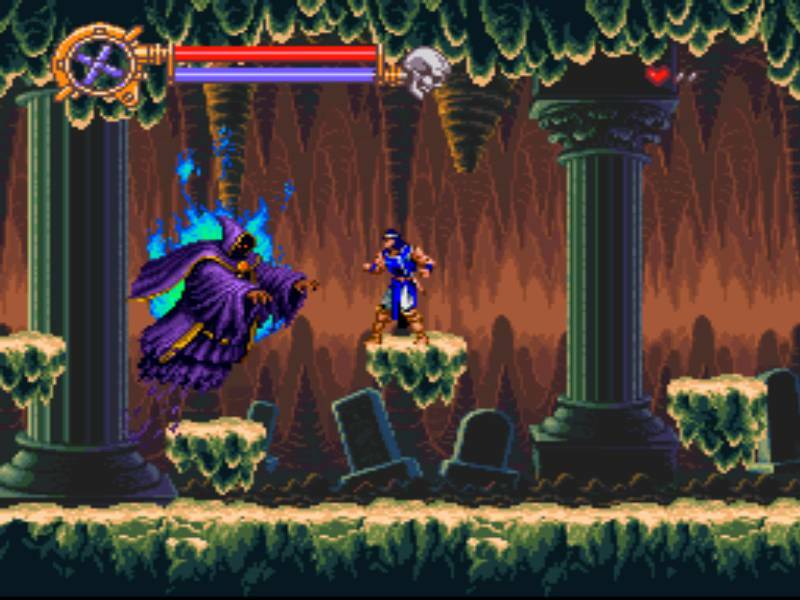 Though Dracula X shares similar graphics and an identical plot to Rondo of Blood, it boasts drastic differences in its level design, structure and even some gameplay elements. This has lead the game to have a somewhat divisive effect on the Castlevania fanbase, though on its own merits it stands as a great entry in the acclaimed series. 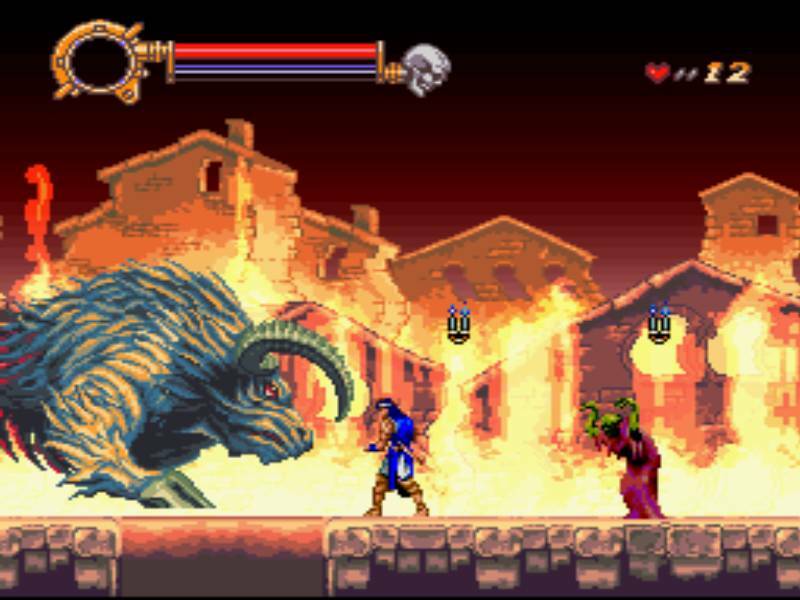 Dracula X falls under the traditional Castlevania gameplay (this game being the direct precursor to Symphony of the Night and the introduction of “Metroidvania”). You take control of Richter Belmont, a descendant of Simon Belmont who (as is family tradition) is on a quest to slay the evil Count Dracula, and in the process rescue his love interest Annette and her sister Maria. Richter uses a whip like Simon and Trevor before him. Though it initially might seem disappointing that Richter cannot swing his whip in every direction like Simon could in Super Castlevania IV (the more popular SNES entry), he makes up for it with an overall better sense of control. Richter’s jumps are less stiff and more controllable, he doesn’t get knocked back nearly as far as his predecessors when hit, and (mercifully) he has a much better sense of control when going up and down stairs. Along with the whip, Richter can also find the usual secondary items: the throwing knife, holy water, crucifix, the axe, and the stopwatch, which all require collectible hearts to be used. This time, however, each secondary weapon also comes with a screen-wide special attack, which can come in handy in areas chock-full of enemies, but require a whopping fifteen hearts for every use. 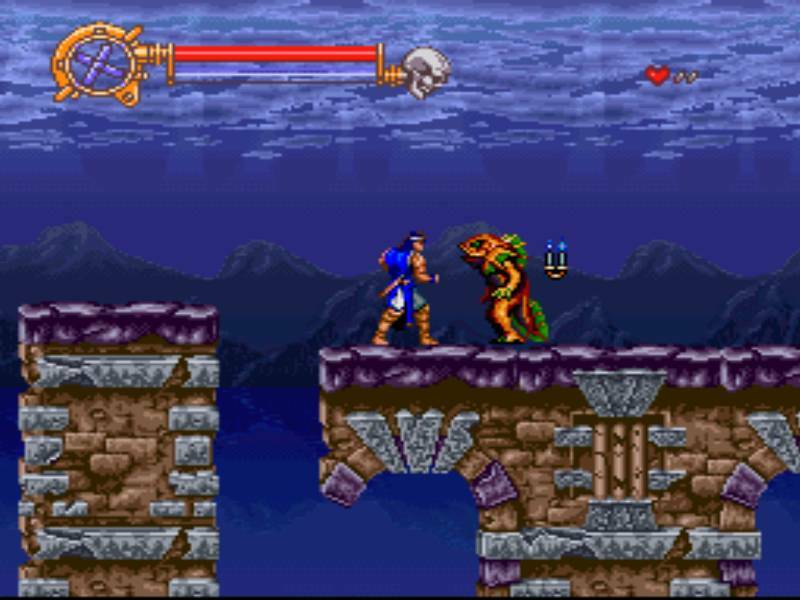 The levels are progressed linearly, with Richter moving to the next stage whenever a boss is defeated or when other requirements are met. You’ll play through a total of seven levels on any given playthrough, but there are nine levels total, with alternate fourth and fifth stages available. The number of alternate stages is reduced from the original Rondo of Blood, but they still add a sense of variety to the game. And given that Annette and Maria are held captive in different levels, you’ll have to know how to find them if you want the best ending. The paths to some of the alternate levels can be a bit tricky, which might be off-putting to some, since you’ll have to either input a password or start the game over to get back to that point if you missed your opportunity to go down a certain path (you can end up in the fourth level that doesn’t house a damsel in distress simply by falling into a pit in one of the rooms in the third level, which is incredibly easy to do as you’re bombarded by floating medusa heads and dragon skulls). But if you can put up with the trial-and-error approach, it’s rewarding to find the different ways to play through the game. At only seven levels in a playthrough, Dracula X is admittedly short, but the game’s high difficulty makes it feel a lot bigger. The enemies can get tough, with some of them being able to take Richter out in a few quick hits. The platforming can also be challenging, but thankfully due to the levels themselves and not Richter’s movements. And you may throw your hands in the air when you can finally make it to a boss without dying, only for the boss to send you to a game over in a very short amount of time. As difficult as the game is, it never gets particularly frustrating. The healing items are still a bit too infrequent, but checkpoints appear more often than in previous games in the series. And while the levels can be a little lengthy, they aren’t so large as to make it a chore every time you get a game over and have to start them over. Another highlight of the game are the graphics. The game doesn’t utilize the same Mode 7 effects that Super Castlevania IV did (no rotating rooms this time), but it still looks gorgeous even today. The sprites are vivid and detailed, and the animations are surprisingly smooth, even for a SNES game. But even the great artwork is secondary to the absolutely incredible soundtrack. Hands down, this is one of the best soundtracks in both the Castlevania and SNES library, and that is saying a whole lot. I could go on and on about the soundtrack alone, but I digress. There’s a whole lot to love about Castlevania: Dracula X, but there are some drawbacks to this version of Richter’s quest. As stated, there are less alternate levels than in Rondo of Blood, so you may feel you’re only getting a chunk of the adventure. Similarly, Maria was an unlockable character in the original game, and became playable after you rescued her, but that isn’t the case here. Finding the alternate routes, while understandably challenging, can sometimes be needlessly difficult (seriously, those pits). You also kind of wish Richter had some more unique moves and that the game used as many visual effects as Super Castlevania IV. Still, even with these shortcomings and half-realized elements, Castlevania: Dracula X is still a great game for any fan of the series or 16-bit games. 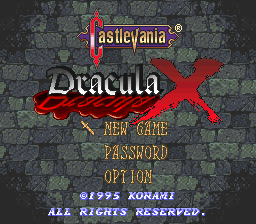 This may not be a popular opinion, but between this and Super Castlevania IV, I find Dracula X to be the better aged game. It has the same kind of fun, but with a vastly superior sense of control, a tighter, more challenging quest, and one amazing music track after another. Yep! Playing all these Castlevania titles is my way of celebrating Halloween on this site. I only wish there were more of them available on the Virtual Console (I can still do the three GBA titles, but that’s it for now). I’ll have to replay Symphony of the Night some time to give it a proper review (expect gushing). That’s a great way of celebrating Halloween. It is impossible to talk about Symphony of the Night without gushing. Thanks! You should definitely hop aboard the Castlevania train, it’s one of my favorite series. Don’t worry about being late to the party, I only really started playing the series a few years ago myself. Symphony of the Night is the title that kickstarted Metroidvania, which has been adopted in most of the handheld entries (some of which are available on the Wii U Virtual Console). But the more linear titles are also fun. I can’t recommend Symphony of the Night enough though.